I have yearnings to be a minimalist. A minimalist expat. Then I wouldn’t have to deal with all those possessions that get bagged and boxed and shipped and stored and moved and schlepped around the globe. I’d be rid of most of that stuff quietly living and breeding in drawers and cupboards and shelves and boxes. 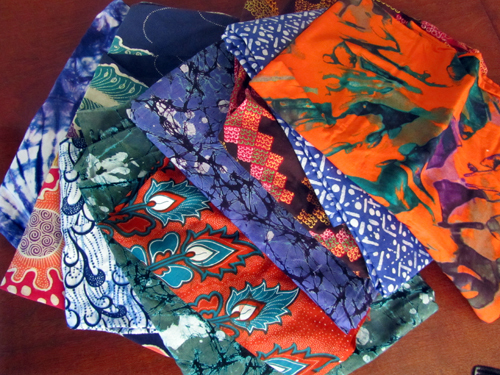 Like all this fabric from Africa — endless colorful meters going unseen and neglected in a storage box. I so loved them when I bought them in Ghana, West Africa. The colors! The designs! Surely I’d find something really creative to do with them. But no, here they are, years later, languishing in the dark. Do you know what these things are? They’re called podstakanniki, tea glass holders, the ones you are presented with when you travel on Russian trains, or so I hear (I’ve never traveled on Russian trains). Why do I have a collection of them? Well, I thought they were so cool when once I was served tea in them in a restaurant in Yerevan, Armenia, a former Soviet republic where I lived the expat life for a good number of years. I thought it would be unique to serve my guests tea in them, so I rummaged around in the Vernissage, the fabulous flea market in the capital of Yerevan, and picked one up here and there, now and then. For fun, you know. But I never ended up getting the glasses that fit in them, and the friends I generally collect along the expat trail are more the wine-drinking types. So here they are, my lovely podstakanniki, stashed away in a box on a shelf. I dream of living a simpler, less cluttered life. To be at peace and spend time meditating sitting on the floor in an almost empty room. Just a decorative plant peacefully spreading its oxygen. Perhaps a little incense burning and mind-altering music playing in the background. You know what I mean. Maybe just a serene picture of a mountain on a wall, a pretty candle, a few colorful cushions . . . well, there I go again, filling up the space. Yes, I have yearnings to be a minimalist. But it eludes me. I swear I spend my wandering expat life selling and giving away stuff when I move – towels and pots and pans and furniture and clothes. But the universe loves a vacuum it is said, so lo and behold I seem to have more stuff next time around. I love these hand-painted dishes. I bought them in the Old City of Jerusalem and in Hebron while we lived in Palestine. I have more than you see on the photo. I do use one or two of them. Not all the time, but sometimes. So really, why should I hold on to them? Some years ago my man and I got ready for another one of those chaotic expat moves and I had a blinding moment of enlightenment: We have too much stuff! Or to be honest, I have too much stuff. My prince can live out of a backpack, and would even prefer to. I don’t consider myself a collector of stuff. I don’t have shelves full of Elvis Presley memorabilia, handcuffs, music boxes, air sickness bags or dryer lint. I’m not a shopper–I don’t like shopping except in funky foreign markets. I’m not much of a consumer unless I’m on vacation to fabulous places like Rome or Paris and spending money on food and wine. Still . . . .
Getting through all the things in the house I hadn’t looked at for ages, I had to admit that, really, I do have proper collections. Objects gathered in different places in the world like the above mentioned African fabric and Russian tea glass holders. And more, as you’ll see below. And what did I do? Minimalism or not, I was not able to part with them so I shipped them all to our new location. Please don’t judge me. Look at these things! Thirty-plus liqueur glasses. All different, pretty, unique, some even antique. How did I ever get that collection? Well, it started innocently enough with a few pretty ones inherited from family. Then I started seeing other ones here and there, and then people started giving me one now and again because they knew I liked them. I hardly ever drink a liqueur. When I have a dinner party almost never does anyone want a liqueur. Hanging on to these pretty things is not a minimalist approach to owning things, but who else would even want them? And what about these African beads? I have a large bin full of them, kilos and kilos of them. Why, you ask? Because they are gorgeous and when I lived in Ghana, buying beads was so much fun because they were everywhere and you can make fabulous jewelry with them. And yes, I actually have made a few necklaces. However, I have enough to start a business and string beads from now till kingdom come. But I don’t. So the bin with beads now lives in the garage, being no good to anyone. If I want to be a true minimalist, I should just sell or give all of these things away. But I don’t really want to. I kinda like these useless trinkets. But rest assured that if the house burned down I wouldn’t weep over them. I think. I so admire people who are true minimalists, don’t you? I long to be one, really, but I might as well admit to myself that there is no hope for me in the minimalist department. What about you? Tell me your tale of woe when it comes to your possessions. Karien, I googled Peranakan porcelain and I see what you mean! It’s gorgeous and colorful. Do you use any of it? One day I hope, like you, to have a house that will have enough space so I can have the things I really like in it. And then to be able to actually use them when friends, guests and eaters come visit. A house in a place where our international wandering friends will want to come and visit . . . . I suppose we can hang on to our stuff and enjoy it, as long as we don’t get too obsessive about it. And I think I will find some use for the fabric; it is fun and colorful. But yeah, I dream of…not minimalism exactly, but something a bit closer to it than I’ve yet achieved! Thanks for the laugh. I’d love to come over and have a liqueur from one of your crappy glasses! After moving 5 times in the past 5 years, I’ve become quite a minimalist too. Your collections are beautiful though, and I can see how they might be hard to part with. My husband will envy your dishes from Jerusalem. (They are gorgeous and neither of us have ever been there.) I find that our main arguments revolve around the “stuff” that he wants to keep from our travels and my desire to get rid of all “stuff”. As soon as he himself (rather than his company) has to pay for the shipping of his stuff across the globe, he might rethink the desire to keep some of it. So far we have not been in that position, but we might be in the future and then I’m sure we’ll get more radical about disposing of stuff. Well, look at it this way, with all the places you’ve been to, at least you’ve collected interesting clutter. 🙂 I love the tea glass holders! I used to hoard all sorts of things but living in a tiny house helps – no shopping allowed unless it’s a necessity. I tend to give away stuff that I don’t use but I STILL have clutter! Bleah boo me. That’s my dream! And then I hope you come and visit! How’s the south of France? Great food and wine culture! Do it, follow your dream. And you can capture it all on youtube! I’ve heard the south of France is truly beautiful. I couldn’t go minimalist. I love my books and my dvd’s too much. Plus some little reminder of a place I visited some time ago. And another little reminder of a place where I lived. No, I couldn’t go minimalist! Such great memories, but how about ebay or estsy for the beads? 🙂 We’ve only been expats for about 3 years so my collection so far has been limited to Turkish ceramics and tea glasses – things that I do use on a regular basis. But who knows what I’ll add to the collection down the road. Louise, I have a collection of jewelry too, but not of the precious variety. I covered a big cork board with a piece of fabric and my necklaces no hang from push pins to make an interesting collage. It now serves two purposes, one as a place to keep the jewelry and another as a fun decorative display. It works well because at a glance I can see what I have and what to choose to go with what I’m wearing. I love flea markets too. Hope you don’t get into fights with your son!